I have a client who is interested in providing their trail network for users to download to their handheld GPS receivers. After searching extensively, I have not been able to find a solution to what I thought would be a simple process: How to convert existing GIS data into a format that can be downloaded onto any GPS receiver, without having to convert the data each time. Ideally, the file would be converted once (or at least once per receiver manufacturer), and provided for download via their web site. GPX, the GPS Exchange Format, has become the de-facto standard for delivering GPS and GIS data to consumer-grade GPS receivers. GPX files can be used by hundreds of GPS receivers and mapping programs, including ExpertGPS, Google Earth, MapSource, MapSend, and MapCreate. Ten years ago, there simply wasn’t a common file format, so you had to distribute different files for each brand of GPS receiver (and usually, several different formats for the GPS receivers within a single brand). GPX has changed all of that. I happen to be one of the founding fathers of the GPX file format – I helped write the initial GPX 1.0 file format, and have written and maintained the GPX documentation since day 1. 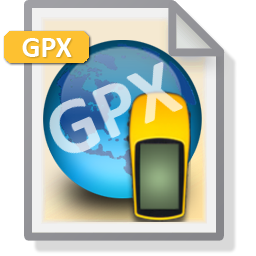 ExpertGPS, as you might expect, uses GPX as its native file format, and is widely used as a GPX authoring tool and GPX file converter. Once you configure ExpertGPS to use the same coordinate format and datum as ArcMap, you just click Import on the File menu, and select your shapefile data. ExpertGPS Pro will convert your .shp polylines and points into GPS tracks and waypoints. Click Save to save the trail network in GPX format. Your data is ready to be distributed – anyone who downloads the GPX file from your Web site can send it to their GPS using their favorite mapping software. (If they don’t have software, EasyGPS is GPS freeware that works with any GPS.